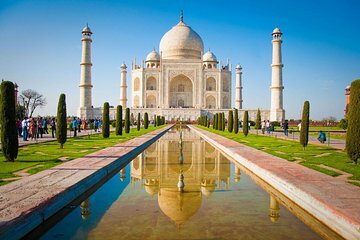 A perfect introduction to first-time visitors to India, this comprehensive 3-day tour with a private guide showcases India's Golden Triangle. You’ll visit many famed attractions including the UNESCO-listed Taj Mahal, Agra’s Fatehpur Sikri, and Jaipur’s renowned Amber Fort, plus enjoy views of Hawa Mahal, aka the Palace of the Winds. Hotel accommodations with breakfast take the guesswork out of your travel arrangements.